What is “private mortgage insurance”? What are “points” and “origination fees”? Should I choose a fixed rate or an adjustable rate mortgage? Should I lock my interest rate at application? What information will I need up front? A conventional loan is not insured by the Federal Housing Administration and typically requires a minimum 3 percent down payment. The maximum conforming loan amount is currently $484,350. Generally speaking, underwriting standards are higher for conventional than for FHA loans. In most cases, borrowers with higher credit scores and/or larger down payments will find conventional loans to be a lower cost option than FHA loans. FHA loans are insured by the Federal Housing Administration and typically require down payments of 3.50 percent. Loan limits vary by county. 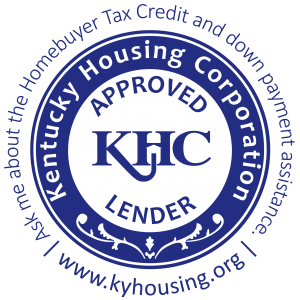 The current limit for Jefferson County, Kentucky is $304,750 for single family housing. FHA underwriting guidelines are often more lenient than conventional guidelines, thereby allowing borrowers who might not otherwise qualify for financing to purchase homes. VA loans are mortgages insured by the Department of Veteran’s Affairs. If you are a veteran, active duty service member, or member of the Reserves or National Guard, you may be able to obtain a VA loan requiring no down payment. The current maximum VA loan is $484,350. While most VA insured loans charge a VA Funding Fee (as a percentage of the loan amount) in lieu of mortgage insurance, veterans receiving VA disability benefits are exempt from the fee, making VA financing even more attractive. Eligible veterans and members of the military with down payments less than 20% may find VA mortgages to be their best financing option. Private mortgage insurance (PMI) provides protection for the lender against loan default and is typically required on conventional mortgages with down payments less than 20 percent. PMI can be paid on a monthly basis as part of the homeowner’s regular mortgage payment, paid in a lump sum up front at closing, or factored into the interest rate. One point or a one percent origination fee is equal to one percent of the loan amount. Points represent prepaid interest paid at closing for the purpose of obtaining a lower than market interest rate. Origination fees are paid to the lender who originates the mortgage and may usually be avoided by paying slightly higher interest rates. Careful analysis of whether or not the borrower should pay points and origination fees should be a standard part of the origination process. This may be the toughest question of all because no one can accurately predict the future direction of interest rates. Once you lock, normally the locked rate can not be lowered even if the market improves. However, if you initially choose to “float,” rates may move higher prior to closing. An experienced, knowledgeable originator should be consulted to discuss and analyze your options. The most common items include two years’ tax returns and W-2’s, two recent paycheck stubs, two months’ bank statements, a two year history on employment and residence, and photo ID. It will depend on the circumstances and nature of the problems. Mortgage Network staff will work with you to determine whether you qualify for financing right away, or if not, what actions need to be taken in order to qualify for financing in the future. The entire process will typically take 3-5 weeks, depending on the type of mortgage you are applying for. Your originator should be able to give you an accurate and realistic estimate at the time of application. In general, conventional loans are processed more quickly than FHA or VA. The entire process from application to closing generally takes from three to five weeks, depending on the type of mortgage being requested and the complexity of the borrower’s circumstances. Getting pre-qualified enables the homebuyer to determine a comfort range of affordability, both in terms of what the lender will allow and what the borrower deems reasonable. It may also help the buyer identify potential problem areas that may surface in the mortgage process and provides a “head start” in dealing with those issues. Mortgage Network does not charge for pre-qualification. To pre-qualify, the homebuyer will be asked to provide information regarding household income, total indebtedness, employment history, funds available for closing, and credit history. Mortgage Network advisors will be available to answer questions and provide details of the various programs available. The pre-approval process is a bit more involved than the pre-qualification process, but offers a number of advantages. Homebuyers often find themselves competing with other buyers when submitting purchase offers, and a pre-approval letter lets the seller know the buyer is able to obtain financing to complete the purchase. During the pre-approval process Mortgage Network professionals will verify the information provided by the borrower, obtain a credit report, and if necessary, submit the application to underwriting for review. A complete loan approval is issued for a maximum loan amount subject only to satisfactory appraisal and title review of the property to be purchased. Mortgage Network offers free pre-approvals. Whether or not the homebuyer has been pre-qualified or pre-approved prior to the home purchase, once a contract for purchase is accepted by the seller, an application for financing must typically be made within 3 business days. The applicant will be asked to provide a two year history of employment and residences, certain tax documentation, paycheck stubs, bank statements, proof of other investments if applicable, and photo ID. The lender will verify income, obtain a credit report, and have the property appraised to determine its market value. Once sufficient information is assembled to make a credit decision, the file is submitted to underwriting, where the lender evaluates the borrower’s credit risk. The borrower may be asked for additional documentation for final approval to close. The Mortgage Network team makes every effort to obtain financing approval for their clients, even if it occasionally means changing loan programs or terms. Once the loan has been approved by underwriting, the closing may be set. Individual states differ as to closing procedures, however in Kentucky and Indiana, most closings take place at the attorney or escrow agent’s office, with the buyers and sellers both present. The final documents are signed, the necessary funds are exchanged, and arrangements for possession are completed. A typical closing takes about one hour.